1-inch cubes. Complementary seasonings include garlic, mustard, basil, mint, rosemary, and sage. Lamb fat solidifies once the meat cools, so the meat should be served on warm plates. Lamb stew meat usually is cut from the shoulder, neck, breast, or leg (this might also be called a lamb shank). Use it in place of beef, pork, or veal in any slow-cooked stew or braised meat recipe. Use ground lamb as you would use ground beef. The less tender cuts of lamb (shoulder, breast, shank) are best marinated. With origins in Africa and parts of southwest Asia, the ostrich is a huge, flightless bird that can weigh up to 250 pounds and reach up to 7 feet in height. For centuries its meat and eggs were sought, but now ostrich can be raised like other forms of livestock. Although still more exotic than a rib eye steak, ostrich meat is showing up on more and more restaurant menus, a direct correlation to the hundreds of ostrich ranches now in the United States. Some specialty meat markets may carry, or will special order, ostrich meat. The meat is deep red and looks like very lean beef. Ostrich is low in saturated fat and has very little cholesterol. Because ostrich is a bird, it technically is classified as poultry, but it tastes more like venison and is similar to lean beef in its color and texture. The best ways to cook ostrich are by sauteing (pan frying or cooking) and quick grilling. Because it is such a lean meat, it easily becomes dry if overcooked. The best cuts of ostrich are the fan fillet, inside strip, tenderloin, and oyster. Rub olive oil on ostrich before grilling, then season with herbs or a touch of salt and pepper. Substitute ostrich in any recipe calling for lean beef or venison. Pork was popular early in American history because pigs offered large litters of offspring and meat that could be preserved by smoking and pickling for long winter months. Pigs also would eat anything available. A typical farmer owned four or five hogs. 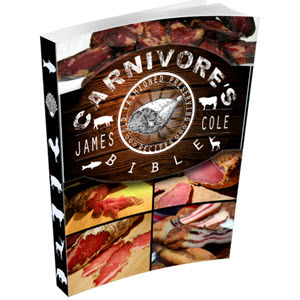 An early governor of Virginia was one of the first to introduce swine to the New World. The state is famous for the quality of hams and other pork products produced there. Although pork generally refers to swine younger than 1 year, most pork today is slaughtered at a younger age (6 to 9 months) to produce meat that is more tender and mild-flavored. The diet of a hog before slaughter has changed. What the colonists once thought was a positive — that a pig would eat anything — caused trichinosis, a food-borne disease that was once acquired almost exclusively from undercooked pork. Today's hogs are fed a diet of grain, proteins, vitamins, and minerals, and trichinosis is thus rare. Until recently, pigs were bred to be hefty and fat, but pork has been gradually transformed by concerted breeding efforts to produce leaner meat. In general, today's hogs provide meat that is lower in calories and higher in protein than just 10 years ago. On average, pork is 31 percent lower in fat and 14 percent lower in calories than it was in 1983. However, not all pork cuts are lean, depending on the part of the pig used. For example, bacon still has 14 grams of fat per ounce (about 4 slices), but extra-lean cured ham may have less than 2 grams of fat per ounce. Pork is an extraordinarily versatile meat. Pork comes to market in two basic forms: fresh and smoked. Only about a third of all pork is sold as fresh pork. The majority is cured, smoked, or processed into items such as bologna and hot dogs. The rump and hind legs of the pig are usually cured and smoked as hams. The same is true of the belly, or what becomes bacon after curing and smoking. increase the loin's length (see sidebar: Pork Cuts: Where They Come From, page 303). Pork is a good source of thiamin, a B vitamin humans need to convert carbohydrates into energy. It is also a good source of zinc. 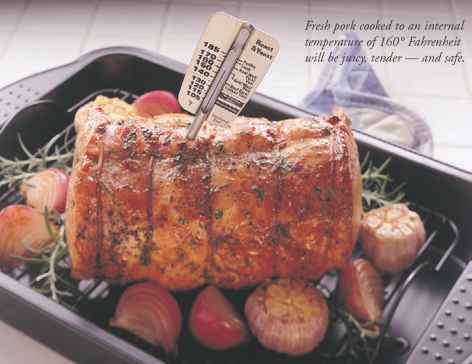 The following pages provide an overview of the different types of pork. Some of the more popular fresh pork cuts are pork chops, pork loin, and pork ribs. There are three types of pork ribs. Spareribs are from the breast and rib sections and provide little meat. Back ribs, or baby-back ribs, are cut from the loin, so they have more meat. Country-style ribs, from the shoulder end of the loin, have the most meat, but not necessarily the most flavor. When purchasing fresh pork, look for meat that is pale-pink with a small amount of marbling and white (not yellow) fat. The darker the pink flesh, the older the animal. Fresh pork was once cooked to an internal temperature of 170° to 185° Fahrenheit to avoid trichinosis. But with the new leaner pork, such a temperature is no longer necessary, nor is it advised. Cooking meat to this temperature will dry out the pork, making it chewy and hard to cut. Some older cookbooks on your shelf still may advise this higher temperature as a guide, but a better internal temperature is 160° to 170° Fahrenheit, which will produce juicy, tender meat. At this temperature, the inside of a fresh pork cut may still be pinkish. This tinge of color is nothing to worry about as long as the internal temperature has reached at least 160°. That temperature destroys any organisms that could cause trichinosis. Fresh cuts of pork can be prepared with dry-heat cooking methods of grilling, broiling, and roasting, but marinating or basting may be necessary to keep the meat tender. Marinades made from citrus fruits add a nice accompanying flavor to pork. The acid from the fruit also helps tenderize the meat. Pork holds up under some strong sauces, such as barbecue sauce. Pork can be sliced into medallions and added to stir-fry dishes or served with steamed vegetables for an elegant entrée. Sweeter foods, such as applesauce or sweet-and-sour sauces, also complement the flavor of fresh pork. Ham comes from the rump and hind leg sections of the hog and is available in either fresh or cured forms. Fresh ham commonly is roasted, but cured ham, which is often ready-to-eat, can be quickly baked, panfried, or microwaved. The meat is usually cured in one of three ways: dry salt curing, brine curing, or brine injection curing. For dry curing, the surface of the ham is heavily salted, and then the ham is stored to allow the salt to saturate the meat. In brine curing, the ham is immersed in a sweet, seasoned brine. If sugar is added to the curing mix, the ham may be labeled sugar-cured. Most mass producers of ham use the injection-curing method, in which the brine is injected directly into the ham, shortening the curing process. After curing, a ham may be smoked to add flavor and aging capability. Gourmet hams are heavily smoked for a month or more. A wide selection of specially cured hams are also imported from many European countries, including German Westphalian ham, which is smoked with juniper berry and beechwood. Other specialty hams include English York ham and French Bayonne. The smoked flavor will vary depending on the type of wood used (usually hickory or maple) and the addition of unusual ingredients such as juniper berries and sage. Once curing and smoking are completed, gourmet hams are usually aged to develop flavors further, sometimes for up to 2 years. Hams are sold in several forms, including boneless (with the hip, thigh, and shank bones removed), partially boned (with the hip or shank bones removed), and bonein. Most producers of gourmet ham leave some bone in to enhance the flavor during cooking. Canned hams may be a whole piece of boneless meat or they may be created from bits and pieces of meat and held together with a gelatin mixture.